Here are my collective thoughts based on pictures sent to me by Mark P.
As with the 5.4L SOHC the DOHC hits the brake booster. 1. Hit the booster with a hammer to allow for room. 2. Replace the brake booster with a 95 3.8L non-ABS unit. It is not as big. The oil pan hits the frame and causes a gap with the motor mounts. 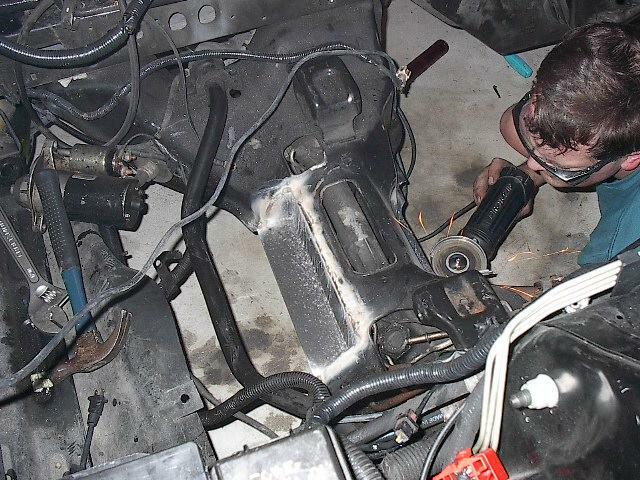 It will fit if you install a 97/98 Mark/ Cobra oil pump, 97/98 Mark VIII pickup tube, along with a 93+ mark VIII oil pan. Of course after installing the pan you have to put the engine on it's belly, rotate it and trim the oil pan fins as required. The motor mounts must be solid aluminum just likes the ones I made for the 5.4L SOHC. Headers will not easily fit. Even Kooks headers for a 4.6L will not fit. (may he rest in peace) and I provided some tech support for HPS Hardball'r when they developed the 4.6L intake. At the time they were going to make a wider version for the 5.4L 2V SOHC. I guess there was not enough interest... Needless to say they do offer adaptor plates for the 5.4L. The electronics should be done just like a 4.6L DOHC swap. AND I THOUGHT A 460 WAS A TIGHT ONE!!!!!!!!!!!!!!!!!!!!!!!! A place that does make k-members for Birds and Cats is AJR Racing. Cost over a grand. Other options are a coil over kit, transmission crossmember and possibly have to adjust the pinion angle in the rear end.. 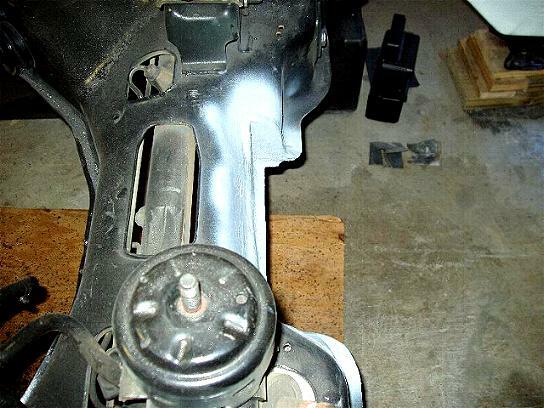 Here Bruce installed a 393 Stroker and he modified his K-member to keep the oil pan. Supercharged 5.4-Liter?The Shelby's supercharged 5.4-liter, 32-valve V8 is similar to the engine in the GT. Ford started with the cast-iron 5.4-liter Triton V8 truck engine and added aluminum heads from the GT, specially calibrated camshafts, a Roots-type supercharger making 8.5 pounds of boost, and a water-to-air intercooler.? ?Under that blower is an all-new low-profile intake manifold, which allows the engine to fit under the GT500's special air-extraction hood. The intake manifold is also special built to be extra low-profile to allow more room for the supercharger. Fuel comes from a dual-bore electronic throttle body borrowed from Ford's 6.8-liter truck engine program, however, the larger radiator, increased-capacity cooling system and the exhaust manifolds are unique to this application. That's a supercharged 450-plus-horsepower, 5.4-liter V8. You buy a 4.6L to 5.4L air intake manifold adaptor from Professional Products. This kit will raise the intake approx. 1/2". Update. Sullivan Performance is now making a fuel injected 5.4L DOHC intake manifold with a throttle body adaptor. Well... Some where someone is bashing my 5.4L SOHC install. It is obvious by all the links... Funny thing is that I never intended to install a DOHC in my car. This is someone else's project... Guys get a life, harassing me to do something I have little interest in doing (like proving you wrong) does not interest me. So what you do not have the skills to make your own intake? I have no plans to update the heads and headers on my car... just because you like to pound your chest. If you want to prove me wrong spend your own money and buy the HPS Hardball'r 5.4L intake, slap on trick flow heads with 5.4L specific cams, get a real toon and a good flowing exhaust and stomp 4.6L's at your leisure.